Mom says I need to write something so I guess I'll tell you what I've been up to since Grandfather Mountain. Well, mostly sweating a lot. This has just been a miserable summer with hot humid days and warm humid mornings. 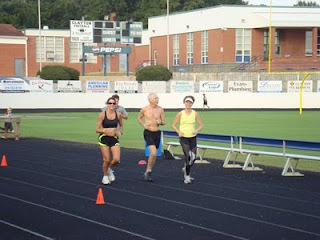 After Grandfather I took a few easy days to recover and prepared to begin training for the upcoming Fall season. Things were going ok but after a couple of good days I would have a bad day and it just seemed to be taking a long time to recover. But then I did do two 50 milers this summer after having not run that far in over two years and both of them were under hot conditions. Finally about two weeks ago I started feeling good again and getting some zip back in my legs. Karla and I stopped with the hill repeats and have started going back to the track now. I've been experimenting with a slightly different approach that we will use for our next marathon and see how it goes. The past couple of weeks we have been joined by The Marathon Mom, Amy Surrette. 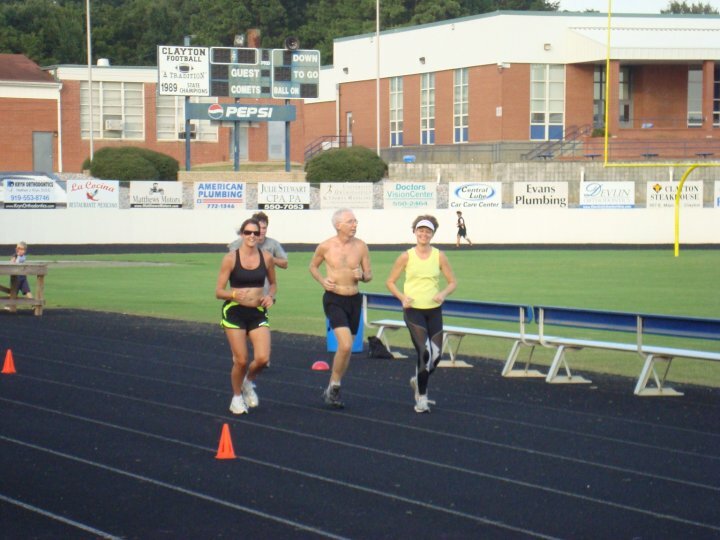 With the hot weather still affecting us we are doing shorter repeats for 400m and 200m with just 200m recoveries instead of the normal one mile and 800m repeats. They are not as fast as normally we would run for those shorter distances but focus on 10k to half marathon race pace. I usually try to get in a little faster workout before they show up and have already seen a big improvement over the past three weeks running faster and with more spring in my stride. On Mondays I have been doing either a marathon pace run of 10 miles or a tempo run at 10k pace and they have been getting better each week. Our usual Thursday afternoon runs were a bit different in August due to me hosting the NCRC August Umstead Series. During August we meet and run the course for the evenings club run to set a time for the runners in the series to try and win the Ultraman Joey Award. I was quite a bit slower this year and struggling with the mid afternoon heat and humidity but it was still fun to run with the ladies. I'll probably have another post about the series soon. That's it for now. Hopefully I'll have several more post over the next couple of weeks now that I've got more going on than training.